DAY 1 - begins on Friday July 19 at 1:00pm with a wonderful Trunk Show. 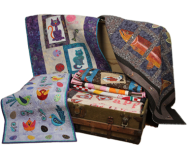 Angie will be showing samples of all the Quilts in her collection. We will begin promptly at 10:00 so you need to have your machine set up and ready to get started. Your lunch and design are all included! SUPPLY LIST coming soon. You must have a working knowledge of your embroidery sewing machine and how to operate it with the embroidery module. Please have the embroidery designs that you will be using already loaded onto your embroidery machine or USB, Compact Flash Drive, or Laptop Computer. NO TIME will be spent in class loading designs onto the embroidery machine. Please bring all of the items listed on the Class Supply lists. In addition you may want to bring things like a thread stand, sweater, reading glasses, cushion, etc. Whatever things that will make you comfortable when you are sewing. It is best to wash your fabrics ahead of time. This way you will know how they will behave prior to using them in a finished project that may take you many hours to complete. There is no need to cut your blocks ahead of time. How to cut your blocks and to what size for hooping will be covered in your class. You should expect to get one or two blocks completed that will teach you the techniques and procedures to successfully complete your project on your own, when you get home. Most importantly bring a smile. Remember you are doing this because it is fun!